Another top quality free VST we have found recently is Pancake 2, a great little VST plugin for modulating the panning for elements of your latest project that is well worth checking out! 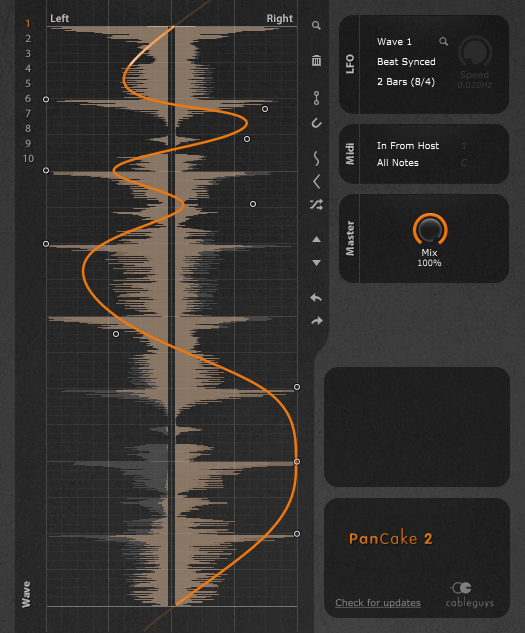 PanCake is a free plugin for most flexible panning modulations. You can construct your own modulation curves. They can be easily drawn using soft or hard control points, thus producing gentle transitions or sharp bends in the waveform. PanCake’s LFO can be beat-synced to your DAW, from a fast 1/128 note modulation up to 32 bars. It can also be set free-running from 0.02 Hz to 5.24 kHz, and can be triggered vie MIDI. Best of all, PanCake is completely free! No login, no registration required. This VST is courtesy of the team at Cableguys, to check out the official website feature for PanCake 2 click here.